Filtering by Category: "Triumph Trophy SE"
I had a chance to ride a 2013 Triumph Trophy for a short test drive recently. My ride was way too short but I was very interested in comparing this bike to my current 2010 R1200RT. 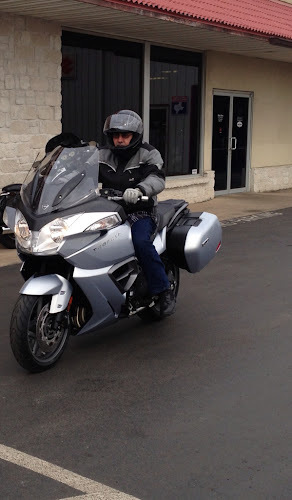 These are my first impression of the bike and are not meant to be any type of detailed road test report. Like I said - too few miles to give this bike a truly fair review. The Trophy SE is aimed at the BMW R1200RT and perhaps even the K1600GT. Some reports say it is aimed to fall between the two BMW standards. Let me start off by saying that I am a boxer fan. I have always liked the basic engine design and my current BMW is my third of a relatively short list of bikes that I have owned. I'm just keeping my options and eyes open to any new sporty touring bikes. Besides, the Trophy dealer is only 6 miles away vs my closest BMW dealer at 265 miles and my independent mechanic is only a bit closer at 250 miles. The bike was so new that the dealer had just prepped the bike. When my brother and I got to the dealer the bike was still in the bike wash bin. A sales person pulled the bike out to the shop area. I looked the bike over and to me it looked like a slightly larger RT. The bags are a bit strange in that they swing together on their mounts. Push in on one bag and the other bag moves with it. That feature is part of the design and is suppose to prevent bag movement from offsetting the balance of the rest of the bike. I can't speak on this feature since there was no way I could test that. I asked if I could start the bike and was told sure (although we were still indoors and all the doors were closed). One thing led to another and I was finally talked into taking a test ride. As it was, the day was beautiful and I had ridden one of my bikes to the dealer so I had all my riding gear with me. Sitting on the bike and starting it I immediately notice a few things in comparison to my 2010 RT. The bike looks and is larger than the RT and lifting it off the side stand I also notice that it feels heaver also. Starting the bike had a pro and con for me right away. The pro was that the engine felt very smooth at any engine speed. As a matter of fact I did not have a sensation of high power at any time while at a stand still (not a pro or con). The con for me was that the throttle feel is very light. I mean VERY light! First thing I thought of was that this bike must be drive by wire! (I need to check but I think it is) The soft throttle is probably something someone can get used to after some time with the bike. Well... time to get rolling. I'll share my points as they came to me during the short ride. No drama putting the bike into gear from the start or at any speed after that. Not as smooth as my RT but I have nearly three years and 36,000 miles to adjust or get used to that bike. Getting on an access road from the dealer's parking lot I slightly over rev the engine before I release the clutch. It's that very soft throttle thing. I adjust my throttle feel again and leave the dealership. Very normal running through the gears once I'm on the access road. It's my first run thru the gears so in my opinion I am not smooth at all. A new ride and you have to adjust your shifting, clutch and throttle movements. The Trophy has no issues - it's just that all bikes are different in this regard. Thinking about it now I was probably shifting at a too low RPM because that is what I am used to doing. Shifting at low rpm is not an issue with this bike since it has a good torque curve but it did make the bike feel very normal i.e. not exciting. I was expecting more. But to get that rush I am required to rev the engine much higher than what I'm used to. Before I forget to mention it I must say that a big plus for the bike is that the heavy weight seems to melt away as soon as the bike starts rolling. The ST1300 felt a little like that but not nearly as well as the Trophy. Good job by Triumph. I do a lazy U turn under an over pass to head in the opposite direction. That gives me a chance to rev higher in each of the gears as I approach the on ramp. Ah... much nicer feeling of power and speed. By the time I get on the expressway I'm doing 65 mph. I first notice that I am getting way too much wind in my face and it's noisy. Btw, I use a Schuberth C3 and it's normally quiet as long as there is a smooth stream of air directly across the helmet. I ride an RT and a sport bike with hardly any fairing but this was really bad. I move the wind shield up and down but it is only a smooth quiet ride when I fully raise the wind shield. I don't like riding like that. The RT is much better in this regard and I'm using the OE wind screen on my RT. I think the reason for this is that the RT puts a tremendous amount of air behind the screen. This air stream seems to push the air coming off the top of the screen much higher than it normally would. The wind screen is flat with no curve or flip on the upper edge and it's that way on the RT and the ST1300. This is one of the first things I noticed on the RT when coming off of my Honda ST1300. The ST1100 has an upward flip on the screen and does a better job than the ST1300 of keeping wind off the face of the rider when looking over the shield. But the ST1300 trumps the ST1100 by having an adjustable wind screen. In this regard the RT blows these bikes away (sorry for the pun) and many owners say that after market makes it even better. I'm happy with my RT screen so I still have the OEM screen. As I move over to the left most lane (i.e. fast lane) I think "after market wind screen" for sure and forget that issue. I up the speed to 70 mph. The bike is smooth - very smooth. If you really search for vibration you have a very slight buzz on the grip and even less on the pegs. I am talking very, very little - nothing to be concerned about. Both the Trophy and RT are very smooth at normal speeds yet very different. I kick it up to 80 mph. Same observations. Move up to 90 mph and it feels much like the 70 mph speed. At higher speeds the Trophy is smoother than my RT. When you push the RT you get that low frequency vibration that in my opinion is much less intrusive than any high frequency vibration or buzz. Push the RT and the engine lets you know that it is working harder. It's part of the boxer "experience". Since there were no cars behind me I slowed down to about 70 mph again and accelerate again to 85 mph. The Trophy had no problems doing this although it did not feel exceptionally fast. Maybe it's because it doesn't give that vibration that my RT gives me when I push it. The Trophy just pushes forward with smooth power delivery. These high speed passes were all performed in 6th gear which is very tall in the Trophy but presented no problems for the bike. It has the power and torque to make these higher speed passes easy. That tall gearing in 6th is a big plus for a touring bike. I like it. On my way back to the dealer I see a large flea market with a huge parking lot. I decide to turn into the parking lot in order to test the slow speed behavior of the bike. Shortly after getting into the parking lot I turn into a lane that has people walking in the middle of the driving lane. This bike must be quiet because they don't notice me until I am right behind them. I'm riding at slightly faster than walking pace. Conclusion - the Trophy handles very well at slow speed. I did not notice any wobble or hunting for balance when I was doing this. It was as if I had been riding the bike for years. I felt at home. Out of the parking lot and back on the access road. I decide to stay off the expressway so that I can do more stop and go driving on my last leg back to the dealer. The bike had a seat labeled "Low Rider". I asked if it was a special seat but the sales guys kept telling me that they knew very little about the bike plus they had not received any sales information on the bike yet. As the bike was offered to me it is a lot lower than my Corbin equipped RT with the seat set on the high setting. In the low setting the two are probably much closer but I think the Trophy would still have a lower seat height. I'm 5'10" with a 32 inch inseam. It was a very easy straddle for me. I'm negligent of not checking the seat setting before I rode off on the bike but in any case this is not a tall saddle. Stop and go riding is uneventful. I had no issues of any type. Braking, turning, and lane changes were all easily performed. The one issue, as I stated before, was the soft throttle but it was not as severe as when I first started off. I'm sure it's a matter of getting used to it. The Trophy is a sweet ride in many ways but I'm not sure it will knock the RT from my favorite list. I felt the Trophy fits exactly between a two cylinder and inline 4 bike. Like I said at the start of this article - I'm a boxer engine fan. 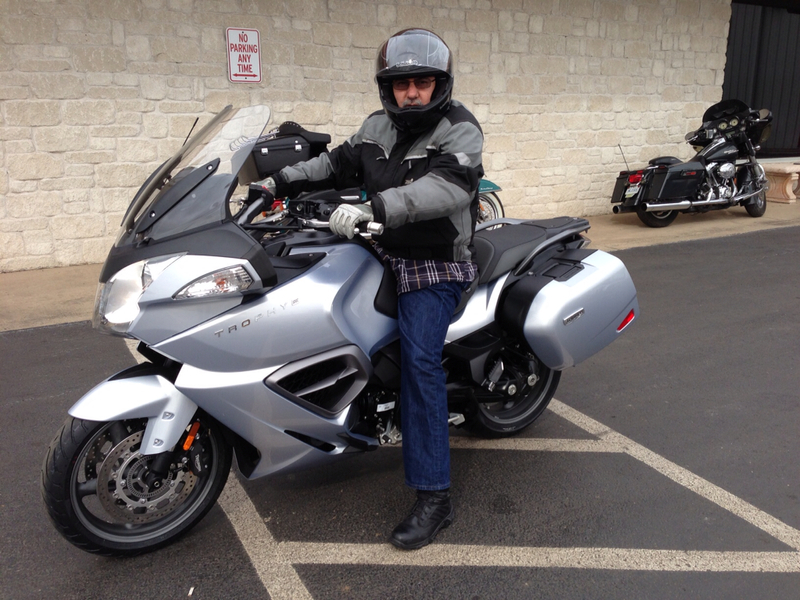 In addition, I like the V-4 engine of the ST1300 better than the inline 3 of the SE. The Trophy just sounded like a lot more was going on while under way compared to the RT. I'm sure that if I ride the bike for a lot of miles many of it's finer points will bubble to the top. Maybe it's mileage or maintenance (lack of) or balance or radio (I did not try it) or the electronic suspension or the total package (what I like about the RT). The Trophy is a very good bike that simply felt normal to me. It did everything well but did not wow me in any. I need to mention that I did not race or push the bike in any way. The Trophy engine is the type that has to be revved to get the extra power from it. It wasn't my bike so I did not push it at all. But saying that I can also see myself being the owner of a Trophy SE for a number of reasons. For now I like the dealer network, range, mileage, options, light feel once it's rolling, and the bike has a good supply of power and torque. I switched from the ST1300 to the RT because of the 160 pounds of weight savings. By the same token the RT is about 90 pounds lighter than the Trophy SE. I see it as carrying a bag of Portland cement on my RT. Maybe not a big task for a young fellow but for my old bones and muscles it swings the scales to the lighter bike. I forgot to mention something that I think is important. The maintenance schedule for the Trophy consists of a minor service at 10,000 miles (like oil change) and a major service at the next 10K miles i.e., 20,000 miles. The Trophy uses shims under buckets for valve adjustment (major service) so I suspect that they will maintain their setting for a long time. So if you keep your bike for 30,000 miles the Trophy will require only 3 service visits during that time whereas the BMW will require 5 service visits. Double those visits if you keep your bike for 60,000 miles (6 vs 10). Makes a difference. If you do your own service it will be a lot cheaper but the labor and parts are still required. This is big plus for the Trophy. Warranty is 2 years/unlimted miles for the Trophy. The BMW is 3 years and 36,000 miles. I listed a price of $19,990 above because that is what the dealer quoted me. The actual price of the Trophy SE is $18,990. My local dealer is also charging $900 for frieght and prep making their total cost for the SE nearly $21,000. My understanding is that other dealers don't have this extra charge. This is a minor point. The Trophy has a rather small fairing pocket but the good news is that it is wired. It's a good place to charge your cell phone or iPod. The pocket is also locked whenever the bike is shut off. The BMW has only one pocket also but it is several times bigger than that of the Trophy. I would never determine a bike purchase based on a fairing pocket but they sure are handy. My RT pocket is always full of things. categories "Motorcycle review", "Triumph Trophy SE", "motorcycle touring", "motorcycle"